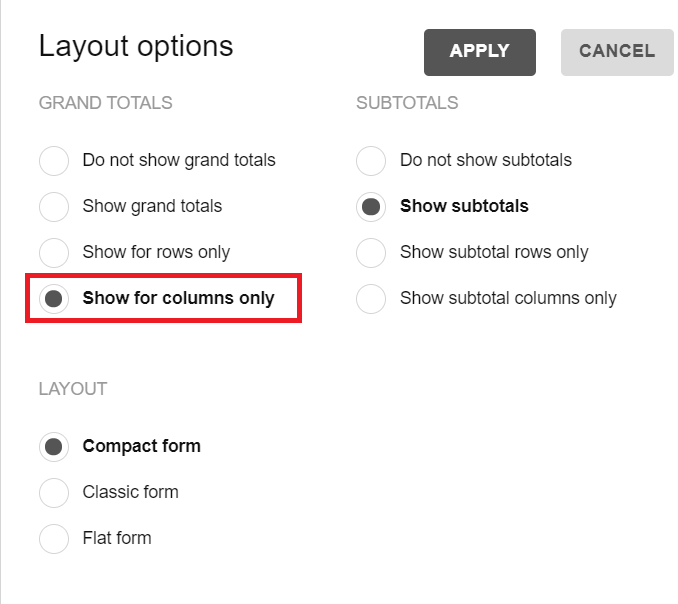 i want to hide Grand Total in my Columns, by default setting. anyone can help me ? This kind of customization can be easily achieved with the help of the Options object. To hide grand totals from the grid, just set a grid.showGrandTotals property to "off". Thank you for your response. I have tried using the samples provided. but not what I want. I just want to hide the total column (Total Sum) and not eliminate the Grand Total at the bottom of the grid. To be clearer, how can I set the default for Grand Total according to the attach file that I gave. Just set a grid.showGrandTotals property to 'columns'. Here’s a CodePen demo with the functionality you’ve described.